The myriad church spires of Venice pierce the golden sunset as we paddle our kayaks towards the Grand Canal. We pause several times as vaporetto ferries roar past leaving us bobbing in their wakes. Over the next 45 minutes we paddle through the tiny canals that crisscross the city then emerge with a sense of triumph into Venice’s main watery thoroughfare within sight of the Rialto, the arch of shops that span the Grand Canal. From this perspective it’s easy to understand that this city is built on wooden piles driven into 117 islands linked by 150 canals and 400 bridges. We reach this point with a sense of trepidation because Venice is a busy place. Walking the shop-filled laneways often feels like being in an endless line for concert tickets as there’s little room to pass – and the queue heading in the opposite direction is just as tightly packed. On the water it’s altogether more hectic: imagine an aquatic version of Rome in rush hour but filled with just about anything that floats. Along the Grand Canal you’ll see them all: garbage boats, ambulance boats, funeral boats, little boys in tiny punts and playboys in gleaming speedboats all interspersed by black, high-prowed gondolas. Everything, from vegetables to computers to tourists, is delivered by boat. However, that’s the daytime scene. As darkness descends, Venice settles down for the night. 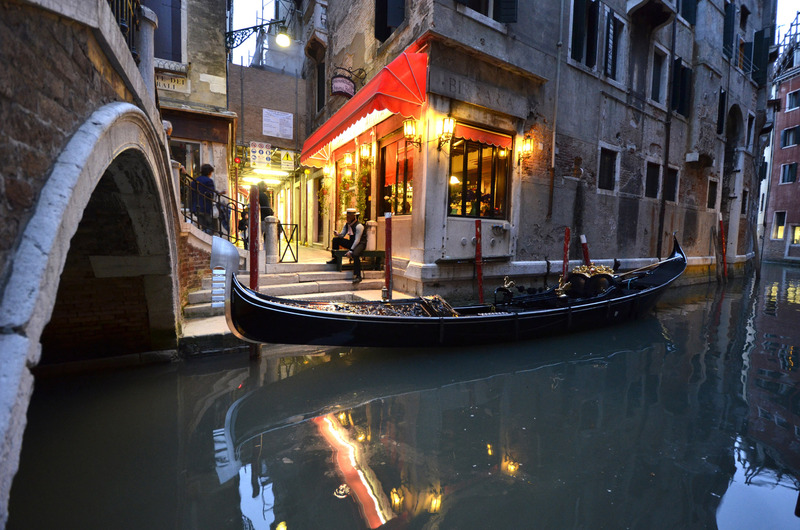 Many visitors leave, locals head home or out for dinner, deliveries stop, and even the gondoliers hang up their red scarves and boaters for the night. It’s another side of Venice’s aura of unreality, a make believe watery world of buildings covered in mosaics, church belltowers leaning at impossible angles, red and white candy-striped mooring poles, marble palaces and charming piazzas. At night, as the lights come on and the bars come to life, laughter spills out of formal restaurants and informal pizzarias. Venice is truly La Serenissima, “the most serene”. On the water, myriad lights burst into shards with each paddle stroke. Even as we paddle under the Rialto, following our guide Rene Seindal like ducklings, we have the Grand Canal almost to ourselves. 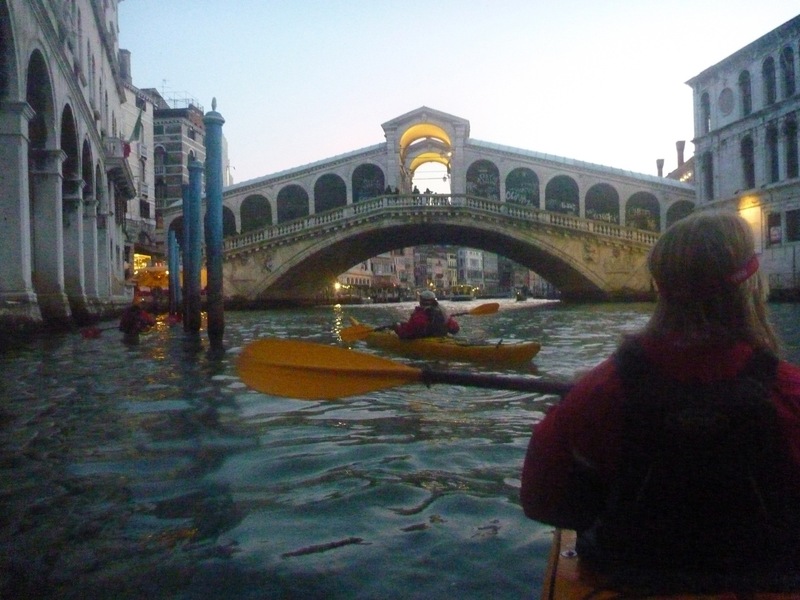 We push on to St Marks Square and our most surreal moment: paddling kayaks under the renowned Bridge of Sighs. This is the most photographed place in over-photographed Venice and, even at this late hour, several tourists take our photos. Kayaks and Goretex may suggest we are in Venice on an adventure budget but that’s very wide of the mark. In fact, our kayaking is an option offered by our hotel – the Cipriani, Venice’s most renowned accommodation. The Cipriani was founded in 1956 by Guiseppe Cipriani, the owner of the equally-famous Harry’s Bar and it has been the accommodation of choice for royalty and the rich and famous ever since. Over the most lavish breakfast spread I’ve ever seen I learn that carpaccio, that dish of thin raw meat and Dijon mustard, was a Harry’s Bar creation. At dinner I fall in love with the risotto of the Cipriani’s executive chef, Renato Piccolotto, that’s so good he’s been flown to the Academy Awards in the USA to cook it. The Cipriani is a grand hotel with a sense of fun. It’s on Giudecca Island with perfect views across the lagoon to the Dogès Palace and St Marks. The room furnishings are elegant, and service and facilities are absolutely five star – from the huge pool to the sleek James Bond-style motor yacht. The gardens were once utilised by Casanova for his assignations. But your strongest recollection of the Cipriani is likely to be doorman-to-the -stars Roberto Senigaglia who knows everyone and can arrange anything while making every guest feel very special. Getting down and dirty in a kayak may not suit every pampered Cipriani guest but it provides an unforgettable experience for those who do. Another unique view of Venice is provided by the hotel’s Venice as a Movie Dream tour that takes you to scenes familiar from the many films made here – from Death in Venice and The Talented Mr Ripley to The Italian Job and The Tourist. Led by a charismatic historian you end the tour with a great understanding of Venice’s overall cultural importance to the world. Back in our kayaks, after leaving St Marks behind, we thread our way down narrow canals that provide a very intimate insight into everyday life in Venice. At times it’s so quiet that the splash of our paddle strokes seems intrusive. It feels so right to steer my own watercraft through Venice that I halt in silence to hold the moment in my memory forever.